Many manifestos have been written over the course of modern age, and the Futurist Manifesto could hardly be considered as the first one. Starting from Romanticism, artists and other creatives left traces of what inspired them, of their visions, theoretical ideas, and dreams not just in art but in written form as well. The Futurist Manifesto, however, stands out as the first that was created before the actual artworks, and it served as a basis, as an ideological basin from where ideas about the new world and new art could be taken, and transformed into visual art and architecture. The appearance of The Manifesto of Futurism in a daily newspaper was another novelty, as its author, Filippo Tommaso Marinetti, shunned artistic publications for a media with a much wider readership. Appearing on the front page of a French newspaper Le Figaro, on February 20, 1909, it created repercussions that would be felt throughout the 20th century. 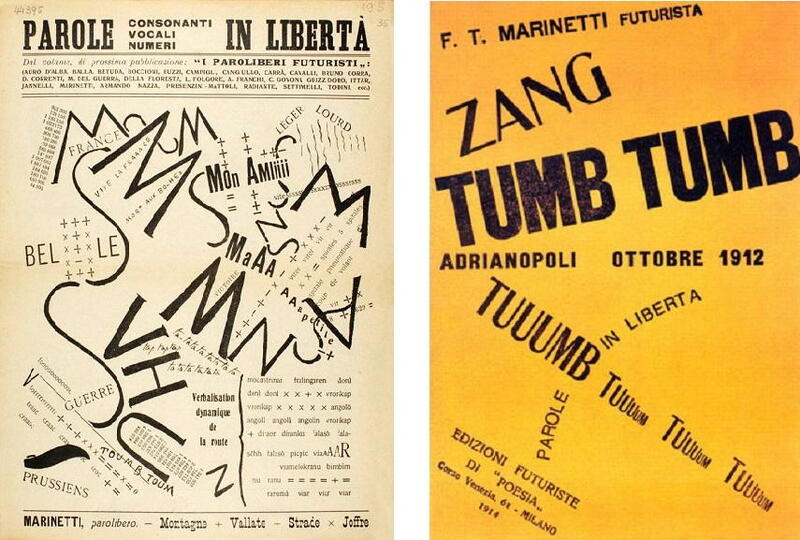 The term futurism was not, however, used for the first time by Marinetti. It was Vincenzo Gioberti in his Augurio dell’Italia futura that used word futurism over a half of a century before Marinetti, in 1843. Specific ideas, however, linked with futurist movement and Futurism in general does not appear in this previous text, although a certain Utopia of a future to come is explicated in it. The Manifesto of the Communist Party from 1847 inspired Marinetti with its radical rhetoric that he will adopt later. In his review Poesia, appearing in 1905 this influence is visible when Marinetti proclaims: “Idealists, workers of thought, unite to show how inspiration and genius walk in step with the progress of the machine, of aircraft, of industry, of trade, of the sciences, of electricity.” It is evident from this short sentence the course Marinetti’s radicalism will take, but also the broader goal he will set for the Futurist movement. Fascination with the technological advances, modernization of urban environments, and speeding up of the industrial world will form an aesthetic foundation of the movement. The Communist Manifesto belongs to a group of political activist writings, and the Futurist one, with similarly radical and provocative discourse that calls for ideological, aesthetic and social upheaval, belongs to the same category. Its importance bears on this categorization. Created at the turn of the twentieth century, the Futurist Manifesto stands out as the announcer of the new artistic movement, but its significance is much broader than the field of visual culture. It is conceived by Marinetti as a new force of Italian cultural revival, the one that is tired of stale and unproductive adherence to the past, and is instead urging for the creation of modern Italy. This new society whose principles should be based on the idea of progress, rejection of the past and creation of new aesthetics, of novel beauty found in war and destruction, is an activist political movement that spread its influence on different social spheres and meridians. 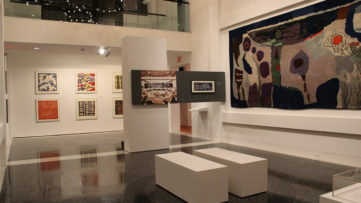 It introduced the idea of new aesthetics that would take the place of the old one, drenched in historical narratives and traditional forms of expression. Surpassing the limits of what is considered proper and socially acceptable, Marinetti and his futurist friends called for the destruction of museums as shrines of an outdated cultural models, and insisted on creation of modern cultural identity for Italy. Familiar with the Italian 19th century culture, Futurist Manifesto came as a response to the problematic relationship between the country’s past and present. Alphonse the Lamartine criticized national culture of the time as a “ ‘cemetery’ of historical fossils” while another intellectual, Gabriele D’Annunzio, described the famous Renaissance cities as “cities of silence.” In such atmosphere, Futurists came as the driving force of change, a force that urged for the destruction of the past upon which a different and novel cultural model could be built. Aware that the Risorgimento, or the cultural revival in Italy of the previous century, has not been completed, Marinetti’s revolutionary doctrine proposed a completely different approach. Instead of looking in the past, and searching for a unifying element in the great names of national history, cultural model of the future should and must be based on the revolutionary aesthetics of the machine, speed and war. Such radicalized message gave Futurism a dimension of new mythology; it was a “religion of the future” that would set Italy once more on a civilizing mission in Europe. Although it first appeared in a French daily, the Futurist Manifesto was primarily directed at Italian cultural space, and its creator aimed to provoke a rupture in historical trajectory that would severe Italy’s ties to its past. However, its significance greatly surpasses national borders. In the field of visual culture it brought the novel thinking about the artistic forms that are no longer founded in the traditions of the past. Proclaiming the machine as the dominant aesthetic factor, it outlined the theme of body-machine that would become a given in anthropological works dealing with man and its relation to industrialized civilization. Its appearance in France affected the cultural milieu and artists living there. Being an ideological support for visual experimentations, artists such as Albert Gleizes and Jean Metzinger soon understood its significance. Having a defined ideology behind them meant that they would be immediately recognized in art world, and therefore they formed the group named Cubist artists in 1911. However, the chauvinism of the French intellectual elite later rejected any impact of Futurism on this artistic model. The influence of the Manifesto around Europe spread not just through print media but also through ecumenical impetus of the founders of the movement who held numerous conferences from Paris, Berlin, London, to Moscow. 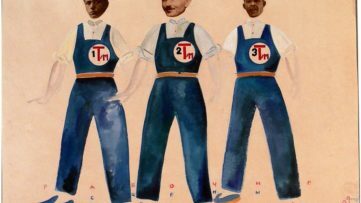 The Manifesto and the movement had significant influence on the Russian avant-garde scene where a group of Russian Futurists was soon formed, but like the French they also denied the influence. Dadaism also owes its activist impetus to the ideas propagated by the Futurist Manifesto. The initial conflict between the two founders of the Dadaist movement, Tristan Tzara and Hugo Ball, which resolved when Ball left Zurich, was about the cultural models two leaders wanted to adopt. While Ball was for a pacific spreading of Dadist ideas, Tzara – who allegedly “lost sleep” over notoriety of Marinetti – urged for a more incisive action. F.T. Marinetti. Image via blog.ali-comunicazione.com. The first Futurist Manifesto of 1909 was followed by 1910 Futurist Speech to the English, and Address to the Spaniards of the same year. It is also important to note that the Futurist Manifesto of 1909 was followed by manifestos written by other members of the group, such as La Pittura futurista: Manifesto tecnico (Futurist Painting: Technical Manifesto) by Umberto Boccioni, La Musica futurista: Manifesto tecnico (Futurist Music: Technical Manifesto) by Balilla Pratella, L’Art des bruits (The Art of Noises) by Luigi Russolo, and Marinetti’s Manifeste technique de la littérature futuriste (Technical Manifesto of Futurist Literature), among others. As evident from this list, Futurism influenced a broad spectrum of cultural activities, from art, to music and literature. Its importance, however, does not stop there. Being above all a political proclamation, the Futurist Manifesto profoundly changed the status of art from a confined discipline of visual expression to a political factor and agent of social and political change. The understanding of artistic production as another element in revolutionary action propagated by Futurists would be transferred to all European avant-garde. Arte-azione or art as a political, social and finally artistic action became the modus operandi for many artists and artistic movements since the publishing of the Manifesto, including contemporary practices as well. A link that Manifesto forged between art and politics where art plays an active role in overhaul and questioning of tradition, history and normative social values defines art’s role to the present day. On February 20th, 1909, a belligerent manifesto announcing the birth of the Futurist movement appeared on the front page of the Paris newspaper Le Figaro and sent immediate shockwaves throughout Europe. The author, a young poet named F.T. 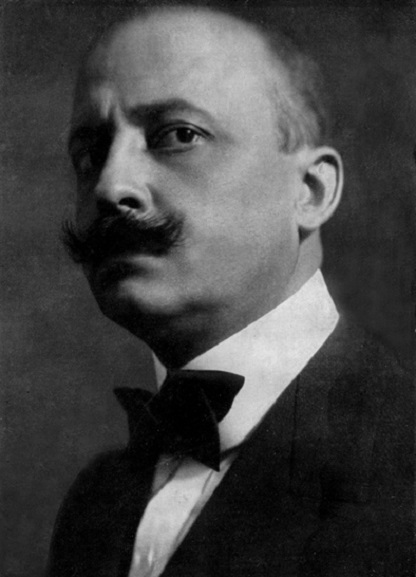 Marinetti, demanded that writers and artists reject the classicism of the past and celebrate the dynamic technology of modern city life. Joined by a group of like-minded artists, over the following years Marinetti pioneered expressions that would eulogise speed and industry, in a reaction against the stasis of the classics, and even against contemporary movements such as Cubism. Available in English for the first time in over 20 years, the Futurist Manifestos are fiery, explosive and witty, and crucial to any full appreciation of modern productions. Lista G., (2009), Genesis and Analysis of Marinetti’s Manifesto of Futurism, 1908–1909, p.78. Lista G., Sheridan S.,(1996), The Activist Model; or Avant-Garde as Italian Invention, South Central Review, Vol. 13, No.2/3, p.14. 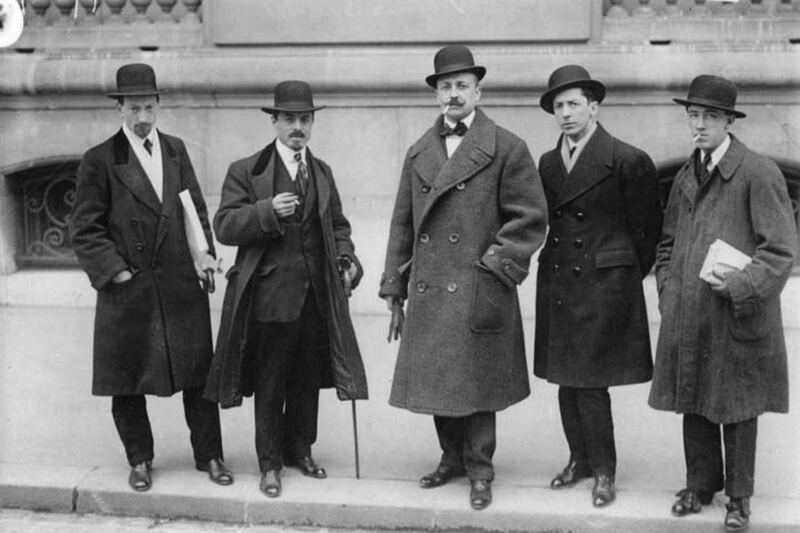 Featured images: Luigi Russolo, Carlo Carrà, Filippo Tommaso Marinetti, Umberto Boccioni and Gino Severini in front of Le Figaro, Paris, February 9, 1912. 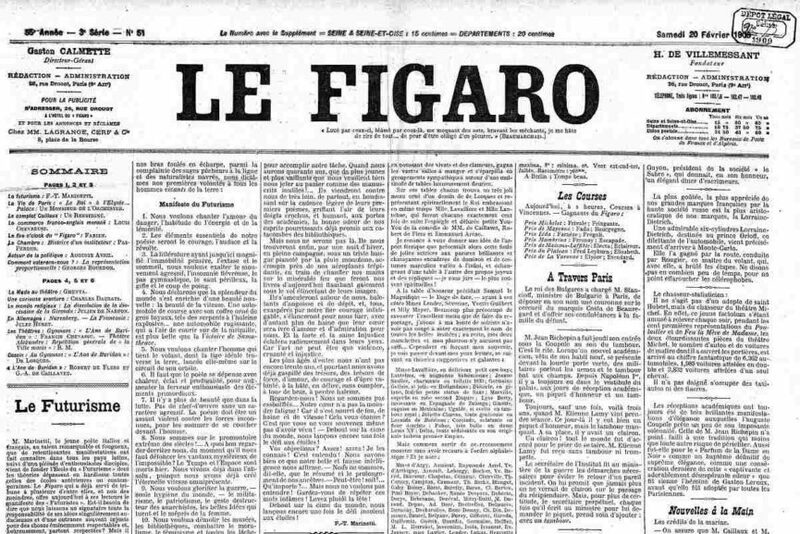 Image via commons.wikimedia.org; The Futurist Manifesto on the first page of Le Figaro. Image via poisonouspens.wordpress.com. All images used for illustrative purposes only.